The Promate Reel.Air-360° rotatable case with hand strap and detachable smart cover is an exquisite combination of elegance and functionality made for iPad Air with retina display. 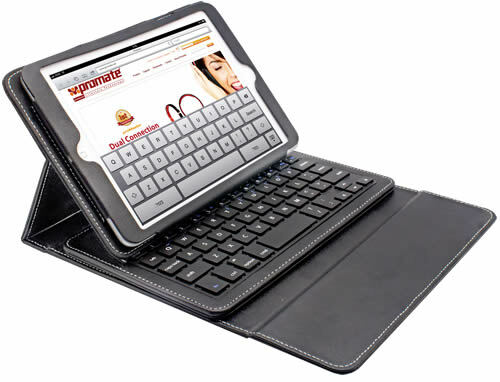 The specifically placed magnets provide auto-sleep and wake functionality and the built-in rotatable hand-strap allows you to conveniently hold your iPad conveniently in multiple viewing angles. The hard back cover protects your ipad from accidental drops and the detachable smart-cover provides additional protection and portability. Its premium leather finish provides a sense of added elegance and style. 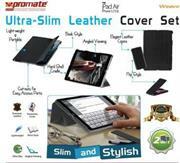 •Cover has flip capability to transform the case into a horizontal stand and position for typing. 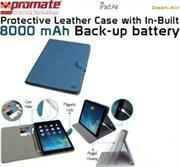 The Promate Agenda Premium Leather case is the perfect iPad Air case for people who like to travel in sleek, elegant style. Made of premium top-grain leather, this stylish and cleverly constructed iPad Air case features distinct card cutouts and a stylus holder that makes it ever so convenient to keep a pen or stylus, business cards, cash or tickets close to your tablet . The cover folds around the back of the tablet, giving you an integrated stand to make viewing much easier. Position your tablet upright to watch presentations or make video calls, or angle it towards the desk for a more comfortable reading and typing experience. Its micro-textured surface is easy to grip and pampers your iPad Air, both inside and out. The Promate Klyde is an Ultra-Slim Multi-coloured Premium Case to protect your iPad Air with style. Designed to withstand the daily wear and tear that your tablet is subjected to, this iPad Air case can fold around the back and also act as a versatile stand. The specially positioned cut-outs on the edges of the case provide easy access to all of the iPad Air’s sockets, buttons and cameras. Available in fresh patterns and colours that will lighten up your mood. 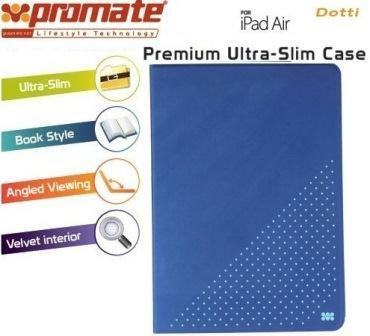 Promate Dotti- Premium ultra Slim and Sporty Case for iPad Air-Carry your iPad Air like a personal notebook in our Premium Slim Case. 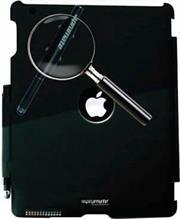 It flips open for quick access to your touchscreen, and closes like a book for more privacy and protection. Its edges are designed to grip your tablet securely, while allowing maximum access to all iPad Air connectors and controls. 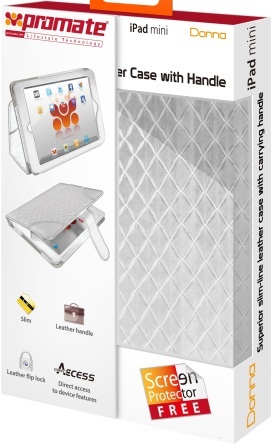 Dotti for iPad is the perfect balance between protection, portability, and quick convenient access to your Tablet and its screen. The Promate Weave-Ultra-Slim Leather Cover Set for iPad Air & iPhone 5/5s combination cases created to protect your iPad Air and iPhone 5/5s with elegance and finesse. 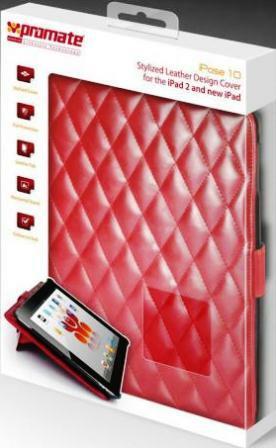 These sleek form-fitting cases feature a protective padded case with soft interior, a custom hard-shell cradle designed to withstand the daily wear and tear that your iPad and iPhone is subjected to and an innovative locking mechanism to ensure your device is safe from accidental drops. Weave can fold around the back and act as a versatile stand. The specially positioned cut-outs on the edges of the case provide easy access to all of the iPad Air’s and iPhone’s sockets, buttons and cameras. 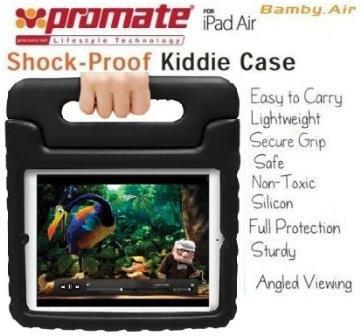 An iPad Air case made for kids, Bamby.Air is a shockproof case which can also be converted into a stand for horizontal viewing angle. 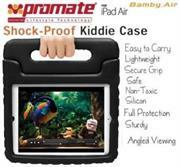 Made from highly durable rubber silicone, Bamby.Air can fully protect your iPad air from shocks and accidental drops. A perfect tool for each and every parent who is wants to keep their kid’s iPad air safe from scratches or damage and yet not obstructing access to their iPad. 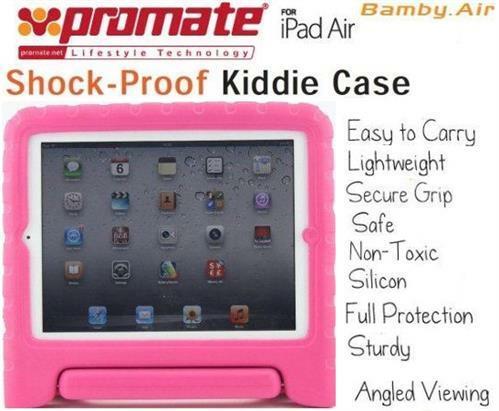 Bamby.Air comes in great funky colours to satisfy girls, boys and even teens and tweens. •Constructed from impact-resistant rubber silicone. 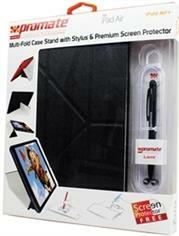 •Corners feature double-thick silicone for outstanding protection against accidental drops. your iPad2. Designed with functionality in mind, the SmartShell.P comes with a unique suction-cup stylus attached by a built-in holder. precession-touch nib for optimal glide. The Promate iFold mini Unique Multi- Foldable Cover Case and Stand for iPad mini is truly unique designed case for all occasions. 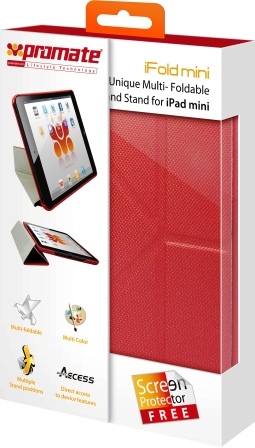 With a traditional hard casing back to protect your iPad mini from any knocks, scuffs and scratches, the iFold mini is a cover case which also comes with one of the most remarkable designs on the market. Specially grooved lines in the front cover allow you to manipulate its shape, giving you a whole range of viewing options when using the accessory as a stand. 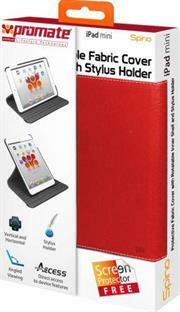 You can have horizontal, vertical and lateral viewing options for the iPad mini. In addition the iFold mini itself is cut away in key areas granting you full access to all your device features. 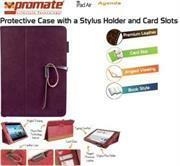 The Promate Tempo is a premium protective leather case with multi-level stand support designed for iPad mini. 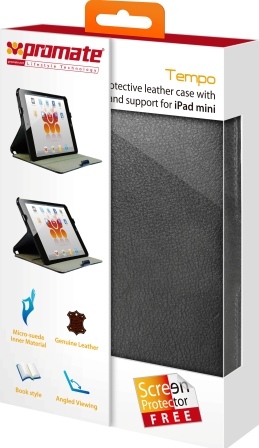 Made from genuine leather material with inner micro-suede fi nish, this device is designed to fi t and protect your mini iPad from any harsh elements and keep it into its maximum function and style. Complete with all openings for direct access to device features, its book-style reading and viewing details also adds up to its rich ways that makes it a must-have case for any iPad mini users who won’t settle with the mainstream. 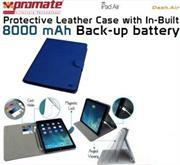 The Promate Totan Leather Cover with Multifunctional Detachable Inner Sleeve for iPad mini provides a sophisticated classic design with detachable leather sleeve case for iPad mini. 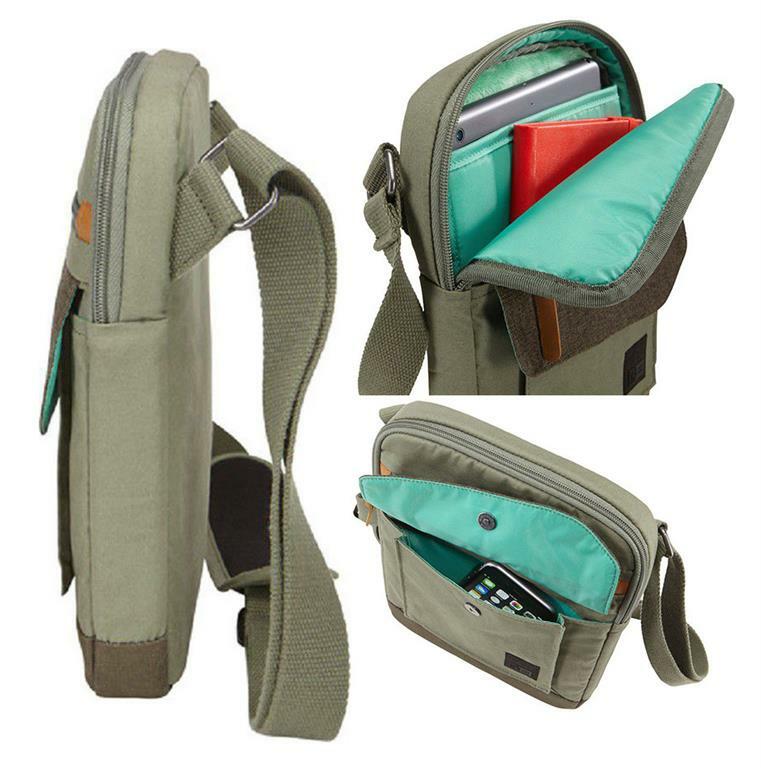 Totan is a versatile solution and utilizes a unique system of poppers and buttons enabling the case to be transformed into a removable, separate sleeve cover for the iPad mini. When opened, the iPad mini can be displayed horizontally and vertically while getting benefit of an inner pocket card holder. Totan serves as the choice for iPad mini device ensuring complete protection without compromising style and design. The Promate Youga Protective leather case with multi-level fold-out stand for iPad minis a premium protective leather case that allows you to both protect and enhance your iPad mini tablet. It comes with a unique foldout stand for multi-level typing or angled viewing. 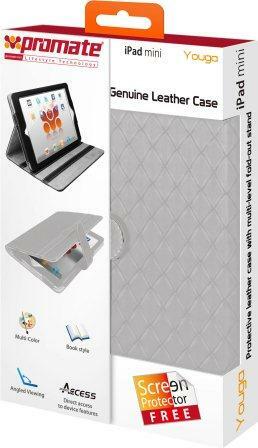 It is supplied with a screen protector and offers an innovative book-style reading and viewing feature. 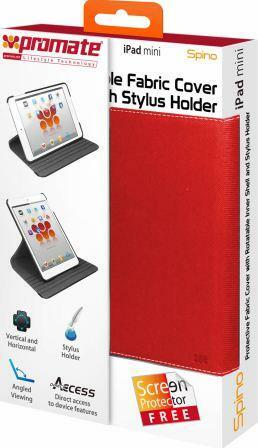 Fitting closely to your iPad mini, the Youga is made from the highest quality leather material and its cutaway design in key areas allows you full, unrestricted access to all of your tablet’s features. 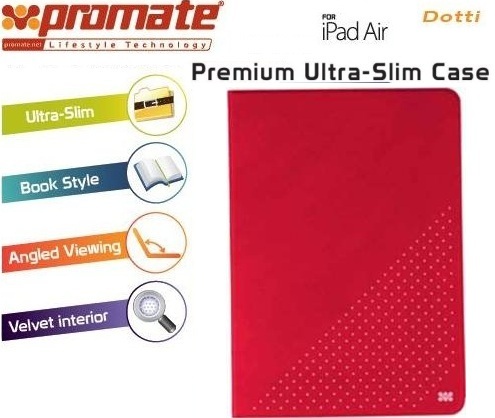 The Promate Donna is a superior slim-line leather case with carrying handle for iPad mini.The Donna balances style, luxury and practicality to deliver a high-performance case that protects your iPad mini. 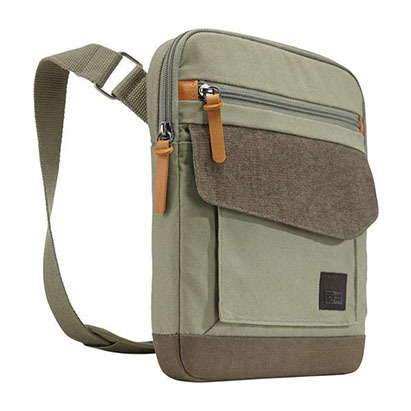 It features a comfortable leather handle for ease of carrying, but it is light-weight enough to hold in your hand, under your arm or place in your briefcase. The Donna is completely bound in supple leather, offering excellent protection against every-day knocks and scrapes. 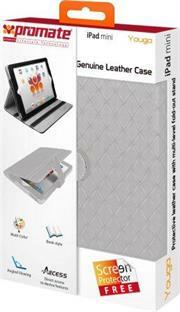 The Donna is a superior slim-line leather case with carrying handle for iPad mini.The Donna balances style, luxury and practicality to deliver a high-performance case that protects your iPad mini. It features a comfortable leather handle for ease of carrying, but it is light-weight enough to hold in your hand, under your arm or place in your briefcase. The Donna is completely bound in supple leather, offering excellent protection against every-day knocks and scrapes. The Promate Spino Protective Fabric Cover with Rotatable Inner Shell and Stylus Holder for Ipad Mini is Simply unique, the Spino protects, tilts and rotates the iPad mini for multi-directional viewing angles. The hard inner protective shell and rotatable back mechanism makes this case one of a kind. View the iPad mini the way you want, tilt it at angles you like. 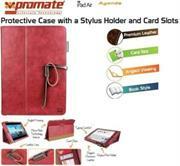 High-quality outer fabric cover, micro-fiber protective interior and stylus holder keeps this case ahead of the competition. Available in choice of colors, Spino is a complete case in one, delivering unique features, style and protection.